If you have chickens you will get used to testing the freshness of eggs. It becomes second nature, after a few “bad eggs” which are gross and disgusting. I’ve never had any luck with candling. I do know that if you shake an egg and it makes a noise, throw it out! this egg is floating. It’s gone bad. 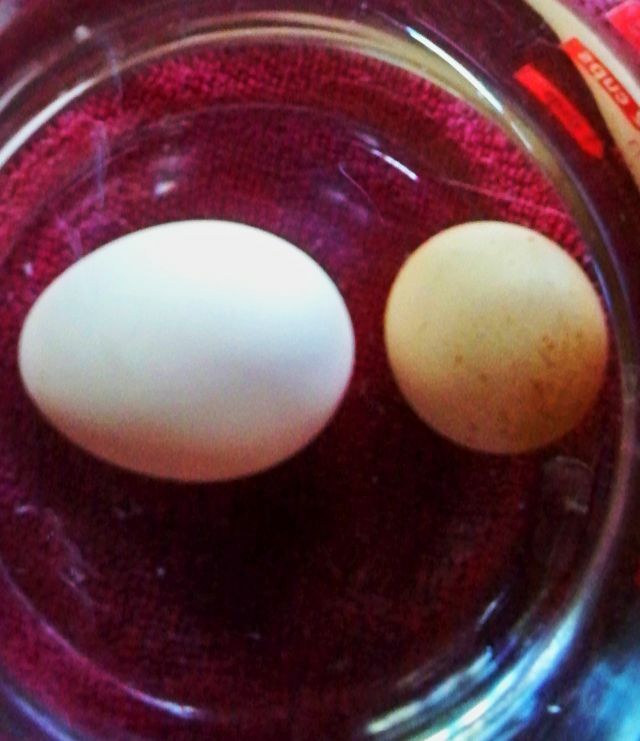 white egg is laying at the bottom of the glass of water, the brown egg is tipping up slightly. Both are good to eat. this egg is tipping up. It’s older, but still good to use. Take a glass of cold water, put the egg in. If the egg lays flat on the bottom, it’s fresh, too fresh to boil, or fry sunny side up. If the back (round, not pointy end) tilts up just a bit…it’s ready for sunny side up cooking. If the round part of the egg tilts up a bit more….then it’s good for hard boiling (before that stage you just cannot PEEL them worth a darn, the shell sticks to the white). 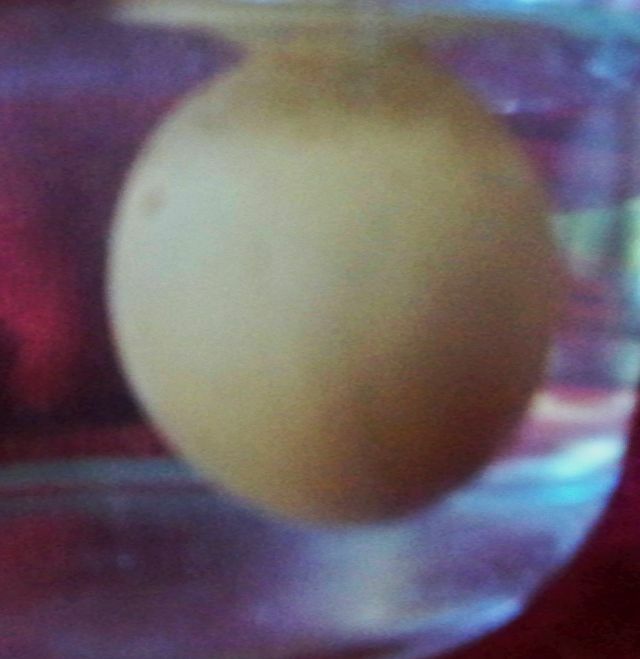 If the egg rises off the bottom of the glass and appears to dance, or floats….toss it. Too old! Old cookbooks caution you to break each egg onto a saucer, and only use the eggs that look fresh. If you start cracking and dropping eggs into the frying pan, there will eventually be a bad egg which ruins the bunch. There is nothing more challenging than a rotten egg in a mess of good ones. The only thing to do is toss it out and start over. A fresh egg will smell faintly like the ocean. A newly laid egg will have a nice round yolk, but it will flatten slightly. 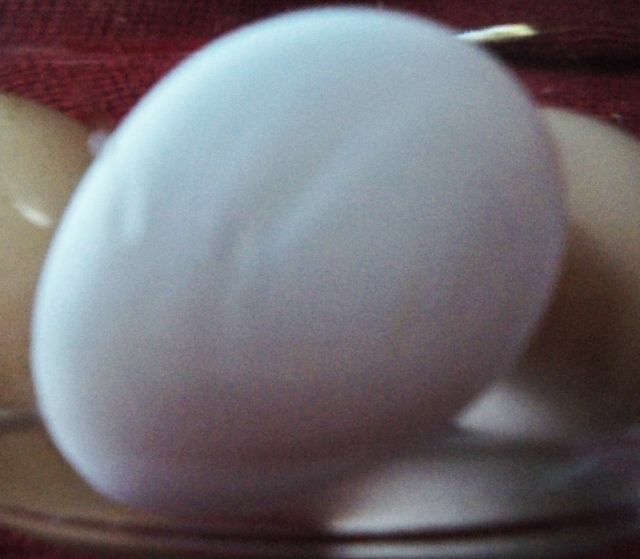 An “aged” egg (a few days under refrigeration) will have lost some moisture, so the yolk will be round and firm, tougher, and sit higher than the white. But, occasionally, there are eggs which have flat yolks, period. They never firm or round up. (But they are still good, and fresh). In the “egg industry” these are often sold commercially, to bakers, mostly. If you find an egg that looks very dark and floats right to the top of the water – handle this as if it were a live hand grenade. (If you hold it up to light it looks dark green and ominous.) Handle this with extreme care! Put it in several plastic bags and take it outdoors to the trash. A rotten egg is something you never want to experience, ever. I brought one into the house and figured it was old, but not bad. It exploded with a loud pop. One word: yuck.